GanttPro is perfect for any group of people with a mission at hand that needs a way to plan efficiently and elegantly. Probably better for large projects with a decent group of people. If you have just two people for a short term project this may not be for you. It helps with custom time frames for your Gantt charts. Like hourly, weekly, daily etc. It provides an intuitive interface. It also helps you understand Gantt charts better. I really like the connectors and the logic built into several components. It also gives you the option to assign work hours and automatically adjust calculations for them. I have just started using it.... It could be more drag and drop though. The default mode should be with the tabs closed. There should be an interactive tutorial. As even though it is intuitive, It may not be so for everyone. 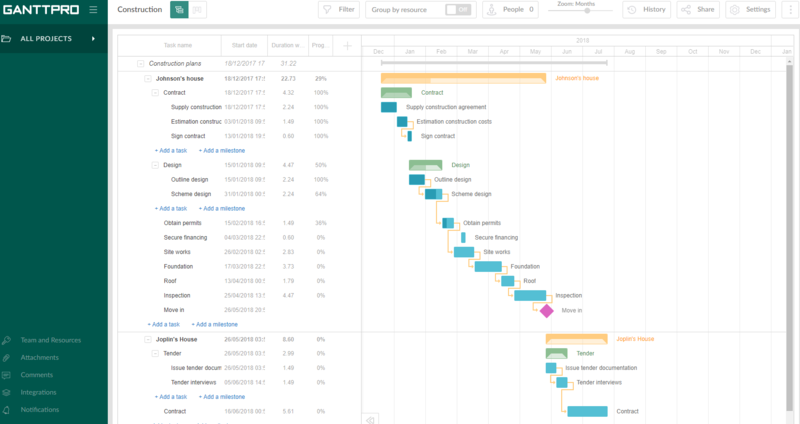 Out of all the options that provide Gantt charts I like GanttPro the best because it is very user-friendly and easy to navigate.